Go ahead and get that cheap plane ticket — just make sure one of these airports is your connection. Layovers are often a necessary evil of less expensive air travel. But these stopovers don’t have to be purgatory for fast food consumption and awkward floor-snoozing. Many airports provide comfortable accommodations for passengers including napping rooms, free showers, and plenty of food options. But what if you want more than just a tolerable connection? From TK to TK, there are a slew of sites to explore without having to leave the airport. themed We’ll take a look at 10 airports where you can find weird and unusual ways to keep yourself entertained between flights without having to step outside. TPE has several themed gates to check out, but the Hello Kitty gate is by far the most excessive and worth seeing. Decked out in her signature pink, the gate features Hello Kitty-themed seats, payphones, world clock, duty-free store, and breastfeeding rooms. Fans of Hello Kitty can actually book a flight on an EVA Hello Kitty plane, which requires you to check in at the Hello Kitty counter. Yeah, it’s kawaii as hell. If you find cartoon cats to be a little much, you can wander over to the Visually Impaired Massage Service Center, which is a partnership with the Taoyuan County professional trade union to provide visually impaired residents with job opportunities, for an authentic “kung fu” massage. Get lit on your layover and stretch your legs in Detroit. The 700-foot underground Light Tunnel connects Concourse A to Concourses B and C, but it’s lined with 9,000 feet of LED lighting synchronized to music. And if that’s not enough synchronization for you, there’s a fountain in the middle of the airport that shoots water to mimic flight patterns. As if those two sites weren’t enough, you can also up your people-watching game by taking the ExpressTram, an elevated train that runs the entirety of Concourse A, which happens to be the second-longest concourse in the world. Video games are notorious time-suckers. How many times have you sat down to play and the next thing you know three hours have flown by? So what better place to waste spend your airport time than at an arcade? Good news for you, the Calgary Aiport has not one but four arcades. Flippers four locations are complete with classic cabinet video games, air hockey, and several pinball machines. Just make sure you set a timer so you don’t miss your flight trying to get that high score. You could probably spend your entire layover mesmerized by the clock in Lounge 2 at Schiphol, which appears to have a man behind its translucent face who paints and then erases the hands of the clock minute by minute. This piece of Maarten Baas art might freak you out if you’ve just smoked all your Amsterdam weed. For a more traditional art experience, check out the Rijksmuseum Annex, which rotates exhibits of Dutch Masters with the main Rijksmuseum in Amsterdam. Exercise your inner conspiracy theorist at the Denver airport, which contains alleged Nazi runways, secret bunkers for the Illuminati, apocalyptic artwork, and, of course, aliens. After scouring the airport for Freemason symbols, mull over what it all means while taking in the sunset over the Rockies from the great vantage points in Terminal C.
If you like horticulture, you’re going to love your layover at Changi. There’s the Rooftop Cactus Garden, the Water Lily Garden, the Sunflower Garden, the Enchanted Garden, the Orchid Garden, and the Butterfly Garden. The Butterfly Garden features one thousand tropical butterflies hanging out around a 6-meter high waterfall. In all, there are a half million live plants, which means you can see more than 800 species in the airport alone. But that’s not even the most amazing thing about this place; there’s actually a 12-meter high twisty slide you can ride down! While the iconic geometric carpet at PDX is no more, there’s still plenty to love here. Portland, the city, has some of the best local food and drink, so it’s no surprise Portland’s airport has a strong snack game. Sample what the city has to offer from one of the food trucks parked inside the airport before heading to Powell’s, the renowned independent bookstore, to browse new and used tomes. You’re also encouraged to help “keep Portland weird” by counting down the minutes to your flight on the largest freestanding cuckoo clock in the U.S., which was carved by a chainsaw artist and stands in the middle of the airport. Take a break from traveling with a little arts and crafts time. 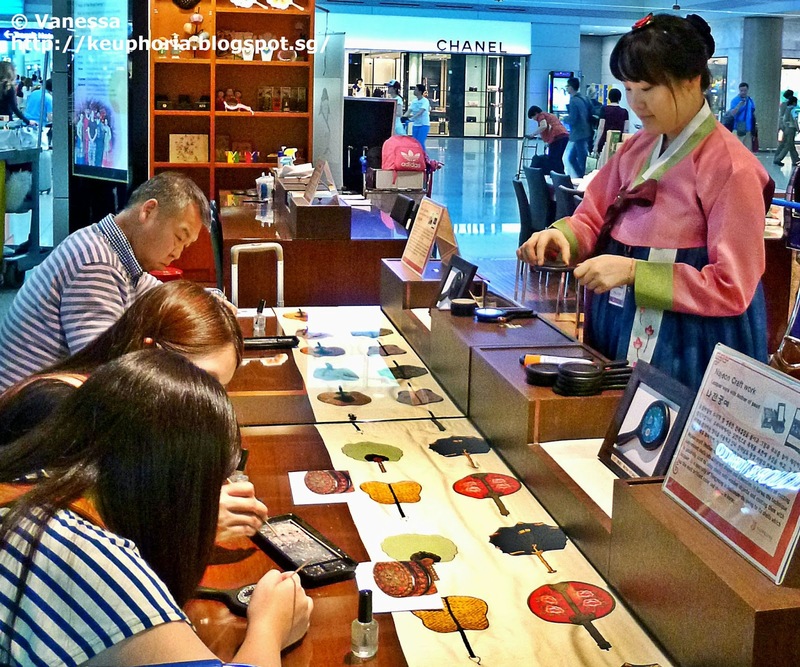 At the Korea Traditional Cultural Experience zone at Seoul’s Incheon airport, visitors are invited to partake in traditional Korean craft projects, creating items you’d otherwise overpay for like fans, kites, macrame, pencil cases, key chains, and other souvenirs. The “Experience” also involves live performances from Korean mask-dancers and 12-string harpists. And if you’re not burned out from crafting, Incheon also offers an ice skating rink, golf courses, and a casino. Sometimes after a long flight you just need to kick back with a cold one. If you happen to be at the Munich Airport, you can do just that — in the world’s first in-airport brewery and beer garden. At Airbräu, you can sit in the main restaurant and watch the brewing process, or you can get a tour with the brewmaster. At only €2.75 for a pint, you can taste all the beers on tap and still have money left over for a fresh schnitzel before you catch your next plane. Many airports now offer movie theaters, but Hong Kong is the only one to offer IMAX. Forget about your long layover as you immerse yourself in 3D movie magic, shown on the largest movie screen in Hong Kong. And if you want even more simulated entertainment, head over to GreenLive Air for a virtual game of golf. Just make sure you come back to reality in time to catch your next flight.